Geologic Faults What Is It? What are the Different Kinds? A fault is a fracture in rock where there has been movement and displacement. 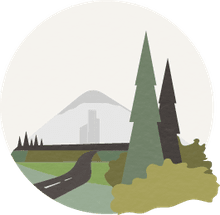 When talking about earthquakes being along fault lines, a fault lies at the major boundaries between Earth's tectonic plates, in the crust, and the earthquakes result from the plates' movements. Plates can slowly and continuously move against each other or can build up stress and suddenly jerk. Most earthquakes are caused by the sudden movements after the stress buildup. Types of faults include dip-slip faults, reverse dip-slip faults, strike-slip faults, and oblique-slip faults, named for their angle and their displacement. They can be inches long or extend for hundreds of miles. Where the plates crash together and move underground is the fault plane. With normal dip-slip faults, the rock masses compress on each other vertically, and the rock that moves heads downward. They are caused by Earth's crust lengthening. When they're steep, they're called high-angle faults, and when they're relatively flat, they're low-angle or detachment faults. Dip-slip faults are common in mountain ranges and rift valleys, which are valleys formed by plate movement rather than erosion or glaciers. In April 2018 in Kenya a 50-foot-wide crack opened up in the earth after periods of heavy rain and seismic activity, running for several miles. It was caused by the two plates that Africa sits upon moving apart. Reverse dip-slip faults are created from horizontal compression or contracting of Earth's crust. Movement is upward instead of downward. The Sierra Madre fault zone in California contains an example of reverse dip-slip movement, as the San Gabriel Mountains move up and over the rocks in the San Fernando and San Gabriel valleys. Strike-slip faults are also called lateral faults because they happen along a horizontal plane, parallel with the fault line, as the plates slip by each other side by side. These faults are also caused by horizontal compression. The San Andreas Fault is the world's most famous; it splits California between the Pacific Plate and the North American Plate and moved 20 feet (6 m) in the 1906 San Francisco earthquake. These types of faults are common where land and ocean plates meet. Of course, in nature, things don't always happen in perfect black-or-white alignment with the models to explain the different types of faults, and many may have more than one type of motion. However, the action along faults may fall predominantly into one category. 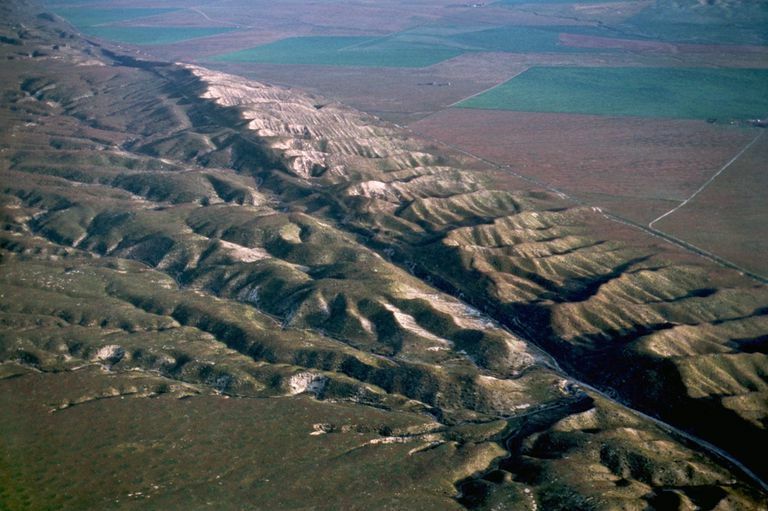 Ninety-five percent of the motion along the San Andreas fault is of the strike-slip variety, according to the United States Geological Survey. When there's more than one type of motion simultaneously (shearing and up or down motion—strike and dip) and both types of motion are significant and measurable, that is the location of an oblique-slip fault. Oblique-slip faults can even have rotation of the rock formations relative to each other. They're caused both by shearing forces and tension along the fault line. The fault in the Los Angeles, California, area, the Raymond fault, was thought to have been a reverse dip-slip fault. After the 1988 Pasadena earthquake, though, it was found to be an oblique-slip because of the high ratio of the lateral movement to the vertical dip-slip. Do You Know the Different Types of Faults? Is California's Hayward Fault an Impending Earthquake Disaster? What Happens When Three Tectonic Plates Collide?